In week 3 we North Carolina A&T pick up FBS win number 2 for the MEAC, while conference foe Howard come crashing back down to reality and Norfolk State’s nightmare of a season only got worse against the defending National Champion. 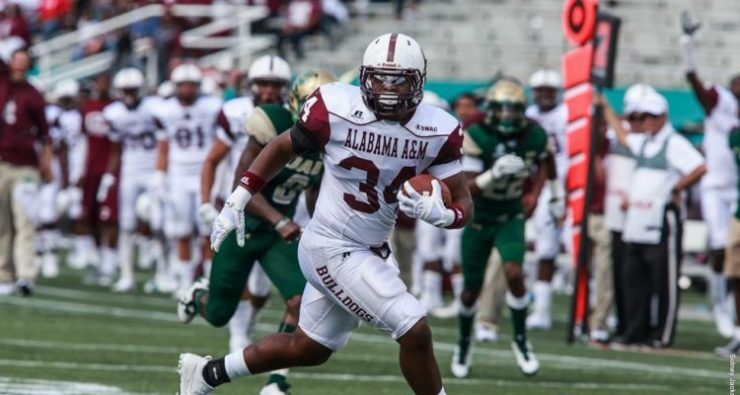 In the SWAC, we saw Jackson State travel to the house that Eddie Robinson built and push Grambling, Alcorn State lose the final drive of the game for the second week in a row, and Alabama State showing signs of improvement for the second straight week. In week 4 most teams will start conference play and the true front runners will be revealed. We’ll take a look of the 8 most intriguing games in HBCU football for week 4. Week 4 will start off with a critical early season matchup on Thursday night in Durham between the Bulldogs and Eagles. The last time the Bulldogs traveled to Durham in 2013, it was also for a Thursday night ESPN-U game and the Eagles were taken behind the woodshed 44-3. That was year number 1 of the Jerry Mack era in Durham and since that time the Eagles have gone 21-3 against MEAC opponents. NC Central has won 15 consecutive conference games and 9 straight home games at O’Kelly-Riddick Stadium which has become the most difficult place to win in the MEAC. SC State dropped its season opener against SWAC foe Southern and had its marquee game vs Charleston-Southern canceled. Both the Bulldogs and Eagles picked up wins in convincing fashion a week ago over Division 2 teams so this week will give us a better idea on the identity of these teams. SC State needs this win to bounce back from uncharacteristic 5-6 season a year ago and get back to title contender which they’ve been consistently under Head Coach Buddy Pough. The Eagles are looking at this season as a redemption tour after winning their first outright MEAC conference title after sharing the title in 2015 and 2014. The season went almost perfect until the Eagles loss The Celebration Bowl 10-9 to Grambling. A loss on Thursday night would cause a minor setback to the Eagle’s plans to get back to Atlanta, while the Bulldogs understand that the first steps to Atlanta will be made on Thursday night in Durham, NC. For the fourth straight week the Tigers of Tennessee State will play on the road. The Tigers started 2017 with the first FCS over FBS win, defeating Georgia State 17-10. 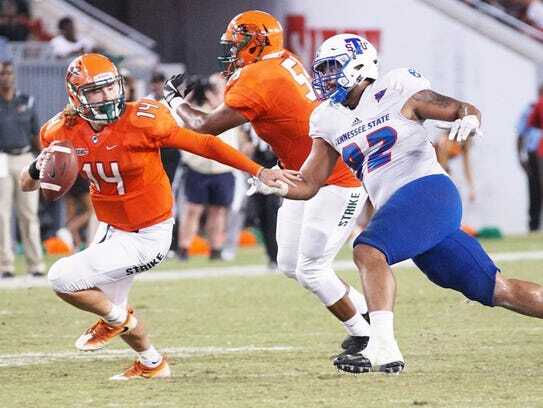 The next week the Tigers avoided upset in Memphis at the hands of Jackson State and followed that the next week in Tampa with a convincing win over rival Florida A&M. Now the Tigers start conference play against a much improved UT-Martin team who’s comes into Saturday’s contest fresh off an upset of 19th ranked Chattanooga. Now the Skyhawks find themselves in a crucial early season matchup that will say a lot about the balance of power in the Ohio Valley Conference. The Skyhawks just missed the post season a year ago with a 7-5 record while the Tigers went from playoff sure shot to missing the playoffs after dropping 3 of their final 5 games. A season ago the Tigers slipped by the SkyHawks at home 34-30 in week 4 but this season UT-Martin appears to be a much stronger team. The SkyHawks limited Chattanooga to 150 total yards, forced 2 turnovers, and limited the Mocs to only 7 points a week ago. 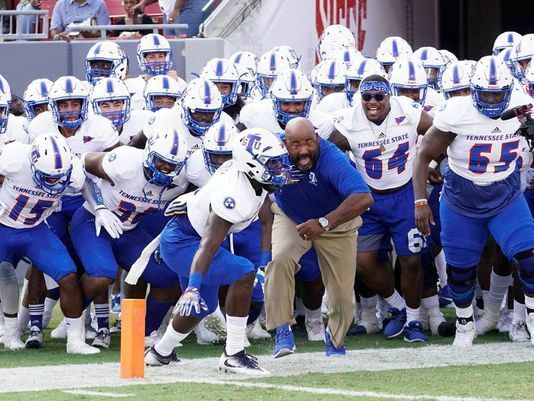 Tennessee State also boasts an outstanding defensive unit that has yet to give up over 15 points in any ball game this season. With two outstanding defensive units in this ball game, Tennessee State’s Treon Harris might be the x-factor a quarterback. Harris struggled in Memphis but bounced back a week ago against Florida A&M going 14-18 for 211 yards passing and 2 touchdowns. The key to this game will be who can establish the run. These two in-state rivals have split the last four meeting 2-2 with each contest being decided by 14 points or less and expect another defensive close scoring game Saturday afternoon at Hardy M. Graham Stadium. For the first time during the 2017 Alabama A&M will face off against an FCS opponent. In the Bulldogs’ first 3 games they’ve been outscored 125-7 opponents and have been outgained 1,238-458. Texas Southern also comes into Saturday’s contest winless after being thumped by Florida A&M and losing a close game at home to Houston Baptist. Both teams need to start conference play off with a win to keep the fan base and alumni thinking positive. You’d be hard press to find any two teams who need a win and something to go positively more than these two teams. Alabama A&M is 11-26 since 2014 while Texas Southern has gone 12-22 over that same stretch. Alabama A&M head coach James Spady needs this win to keep A&M fans from wanting to post the head coaching position on Indeed or Monster jobs. Both teams have shown glimpses of improvement at various points during the season, unfortunately both head into Saturday’s game winless. One positive thing for both teams is that neither team has played a conference game which means that the goal of reaching the conference title game and The Celebration Bowl remains for both teams. This seems to the tale of two teams going in opposite directions. Both teams come into Saturday’s game at 0-3 but The Hornets of Delaware State appears to be a team who is improving while Norfolk State is still trying to pick up pieces after a 61-point shellacking at the hands of James Madison. DSU looked much improved two weeks ago in their conference opener against a Hampton and even led the Pirates until late in the 3rd quarter. Delaware State is very confident coming into this ball game and the Hornets believe that their 14-game losing streak will end on Saturday. If you’re Coach Latrell Scott and The Norfolk State Spartans you must win this game. Latrell Scott has brought to Norfolk State to compete for conference titles but to this point Scott hasn’t gotten the Spartans over the hump. Scott’s first two seasons ended with 4-7 records while he’s off to a 0-3 start this season. If Delaware State is to beat Norfolk State it would give them their first conference win in 670 days and it would almost start talks around the Norfolk area on who will be the next coach to lead the Spartans. These two teams were predicted to compete for their respective divisions and conference title during the SWAC’s media day. Southern started off with an impressive win over South Carolina State but that win may have come at a cost. All-SWAC Quarterback and four year starter Austin Howard was injured late in that ball game and has yet to take a snap since. This is bad news for the Jaguars who historically struggle to win games at The Reservation. Meanwhile the Alcorn State Braves have the faithful of the purple and gold thinking “shoulda woulda coulda.” The Braves have lost each of their last two games on their opponent’s final drive. The Braves suffered a close loss to FBS Florida International and heartbreaker at home against McNeese State. Alcorn Quarterback Lenorris is off to an outstanding start to the season with 1,029 total yards, including 877 yards passing. Footman also has a league-leading seven combined touchdowns and the league’s top passing efficiency at 143.7. Meanwhile the Jaguars have struggled at the quarterback position with the loss of Austin Howard. If there is a bright spot for the Jags it is their ability to run the ball effectively which would be huge if Howard isn’t able to go on Saturday. Howard started off the 2017 with the biggest bang in college football history and followed that up the next week vs Kent State by almost capturing win #2 over an FBS opponent in as many weeks. Then The Bison were brought down to earth a week ago at the hands of Richmond 68-21. Now here comes Bethune-Cookman who has been one of the most consistent teams in the MEAC over the past 5 seasons. The Wildcats have won a share of the MEAC Conference title each years from 2012-2015, but they took an uncharacteristic step back a season ago with a 4-6 record. The question many have asked this season is “who can challenge North Carolina A&T for the MEAC crown?” and two of the responses that you get to that question this season are Howard and Bethune-Cookman. The Bison and Wilcats have not met in the regular season since the 2014 season where the Wildcats put the Bison away 49-12. This season the Bison have a new attitude and is eager to prove to the world that they can compete for the MEAC title and what better way to make statement against one of the top programs in the conference. Saturday looks to be the biggest home opener that Howard has had in over 20 years which gives the Bison a true home field advantage which could lead to the Bison to their first win over the Wildcats in over a decade. The Hampton Pirates came into the 2017 wanted to prove that these Pirates could contend for the conference title. After taking it on the chin in week 1 at the hands of Ohio, the Pirates have won two straight. Monmoth is a measuring stick game for Hampton and we’ll know if this Hampton team ready to take the step of competing for the conference title. Both teams come into the contest at 2-1 and both are also are looking to carry the flag for their respective conference on Saturday. For Hampton the key to winning is establishing the run with senior running back Yahkee Johnson. A week ago Johnson rushed for 132 yards and averaged 11 yards per carry. Johnson could cause trouble for the Hawks defense who gave up 16 first downs a week ago against Albany. To win this game Hampton must start fast and force Monmouth quarterback Kenji Bahar to beat them. It has been over a decade since Hampton has competed for a MEAC title but a win on Saturday would but the entire conference on alert that the Pirates may be back to crash the party. A year ago Alabama State dropped a close game in overtime to Prairie View 24-17. The game turned to Prairie View’s favor after a controversial call reversed a turnover that would’ve given Alabama State the ball and stopped Prairie View’s game tying drive. The Hornets have almost waited an entire year to get vengeance from the Panthers. Alabama State comes into the ball game with an 0-3 record but has shown improvement each week which keeps the Hornet faithful encouraged while Prairie View comes into the game with an 0-2 record after playing a close game against top 10 ranked Sam Houston State and losing big on the road to Nichols a week ago. A win here would give either team a 1-0 record in the conference which is the way that both hope they’d start. Alabama State has improved tremendously on the defensive side of the ball while Prairie View’s defense appears to be a liability. The Panthers offense looked explosive in their first contest vs Sam Houston State but looked erratic a week ago against Nichols. The defensive for Alabama State is their strength while Prairie View’s offensive line seems to be an opportunity for that team. The two teams are a combined 0-5 coming in to the ball game and a win in the conference opener for either team could be a huge confidence booster for their locker rooms.